It all started last summer. My college friend Kathy and I wanted to find something fun to do together. Convergence 2008, sponsored by the Handweaver's Guild of America and being held in Tampa, Florida, fit the bill perfectly. Kathy took beading classes and I took sewing classes. We learned new techniques and had a wonderful time visiting. The drama took place on the exhibit floor. We were browsing near the Harrisville Loom booth when, like a savvy drug dealer, the exhibitor offered me my first "hit" for free. "Hi, there! Want to try a little weaving? It's easy..." I took a few tentative passes with the shuttle, but had to leave almost immediately for my next class. During my next break, an invisible but irresistible force drew me back to the Harrisville booth and I asked to try a little more weaving. Fast forward thirty minutes - I've woven several inches and tried several different patterns. I was in love! But, the course of my love was not destined to run smoothly at first. Looms are expensive. I have a very full and busy life - a husband, a career and two time consuming hobbies. Weaving would have to wait... I knew that I needed to be strong and walk away. Later, browsing in the books with Kathy, I stumbled across the book that sealed my fate. But I didn't buy the book. No, weaving was sometime in my long distant future... I held firm and, once again, walked away. Kathy, however, while a truly wonderful person, has a slightly devious streak. Six months later, right before Christmas, what should arrive in the mail but a Christmas gift from Kathy - the very book that had so captivated me at the conference! I started flipping through the pages and all those feelings came rushing back to me. "What could it hurt?" the little crafting devil whispered into my ear, "to just do a quick internet search and look into looms? 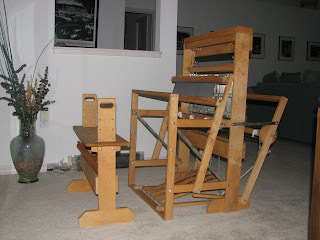 Just to get an idea of what's out there..."
A "used" (but unused) Harrisville 22 inch loom (the exact model I had tried at the conference), for sale at half the price of a new one, about 90 minutes from our home! How about a nice cotton plantation instead of a herd of sheep? 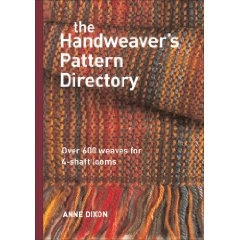 :) Can't wait to read all about your weaving adventures! This is going to be fun!!! Devious Kathy here - lol! Oh, I sooooo know what you're getting for Christmas next year... baaaaaaaaa! :) You even have a place to keep them - I'm sure your parents won't mind some extra critters around.